Verizon and AT&T have both gone on record saying they do not record SMS communications. The privacy debate is one that, understandably, gets emotions stirred, but you can all rest a little easy knowing the official stances of two of the major cellular networks. I think people can feel comfortable we're not storing information that can later be used against them. Unless you have something stored on your phone or on a recipients' phone, it does not stay on our network for a long period. 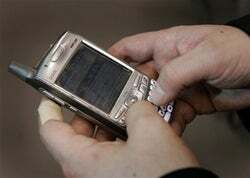 AT&T said they do not store SMS messages beyond 72 hours, which are only kept for delivery purposes. In both cases, once deleted from the system, there is no conceivable way to check your text message communications short of physically going through your phone. "We trust so much of our communications and thoughts, even, to these third parties who are capturing this information and storing it in various ways. It's time for us to think about it."